Charlotte Harbor in Florida is often called a boaters paradise. With great fishing, sailing, over 300 boating days per year, and waterfront homes with docks and marinas, it is easy to understand why boat owners move and retire to this area of Florida. Charlotte Harbor is located in Southwest Florida where the Peace and Myakka Rivers come together to create the state’s second largest estuary. This body of water is home to over 450 species of fish and named a top saltwater fishing destination, the “Top Ten Greatest Places to Sail in the US” by Sail Magazine, and offers 270 square miles of sailing, kayaking, fishing, and boating before entering into the Gulf of Mexico. For those who love boating and want to spend time on the water and not stuck in traffic, the greater Port Charlotte – Punta Gorda area of Florida provides an alternative to the waterfront communities in Miami, Ft. Lauderdale, and West Palm Beach. Plus, you can fish for snook, redfish, tarpon, grouper, spotted seatrout, and many more. Many would think that with living in this fishing haven with exceptional natural beauty would be out of reach for most. However, that’s not true. The Charlotte Harbor area, which includes Punta Gorda and Port Charlotte, has a diverse mix of communities with affordable waterfront homes and lots available for new homes. We have pulled together neighborhoods and communities that offer homes with docks and access to Charlotte Harbor so you can get a sense of the real estate options that exist in this part of Southwest Florida. After reviewing this, we invite you to contact Michael Saunders & Company or visit one of our local offices in Downtown Punta Gorda, South Punta Gorda near Burnt Store Marina or Englewood, Florida. A view of the Myakka River from the El Jobean neighborhood. El Jobean sits on the northern Myakka River, just before it enters into Charlotte Harbor. This neighborhood has a limited number of waterfront homes, but those homes have a short trip to the river and greater Charlotte Harbor and are great for sailboats. This area has a mix of manufactured, single-family and new homes. View El Jobean homes for sale in Port Charlotte. Sitting along the Myakka River, Gulf Cove is a relaxing community that offers landlocked and waterfront homes with docks. These docks are on wide canals and allow for quick access to the Myakka River and Charlotte Harbor. Homes in Gulf Cove range from modest two-bedroom homes to a few large waterfront homes. Vacant land is available for building new homes. View Gulf Cove homes for sale. South Gulf Cove is a relaxed, but upscale waterfront community west of Port Charlotte, Florida. Almost half of the homes/lots have waterfront access, and there is a South Gulf Cove Yacht Club. More than 120 manmade canals, at least 4 – 5 feet deep, wind through South Gulf Cove leading straight to Charlotte Harbor and eventually to the Gulf of Mexico. Vacant land is available so you can build new. View South Gulf Cove homes for sale. An idyllic location within Port Charlotte, set amidst numerous canals, nautical enthusiasts will savor the convenience of access to Charlotte Harbor and the Gulf of Mexico. Almost half of the homes offer waterfront access and allow for docks. Homes on the outer parts of Ohara are prized by sailboat owners; other areas of the community are powerboat-only homes. Homes vary in size and style, and there are lots available for building new. View Ohara area – Port Charlotte homes for sale. With just 20 home sites, Lea Marie in Port Charlotte is the smallest Charlotte Harbor community we feature. The exclusive, gated waterfront community offers luxury homes on the water and deeded docks with direct access to the harbor. Community amenities include tennis courts and a playground. Resales are available for purchase and a few vacant lots are available for building new homes. View Lea Marie Island homes for sale. Just off Charlotte Harbor in Port Charlotte are Grassy Point and Edgewater, two waterfront neighborhoods where many homes include dockage on sailboat water. The private Grassy Point Yacht Club and Marina offers deep water dockage for boat owners. The community consists of many luxury homes that are custom designed and a few vacant lots still remain for custom homes. View Grassy Point and Edgewater homes for sale. A quiet community located on the Peace River, Harbour Heights offers some of the most affordable waterfront property in the county. Unlike most of the waterfront communities that we showcase here, this is not a master-planned community. Homes vary in size and price, but most waterfront homes have a short ride to the Peace River. View Harbour Heights homes for sale. A boater’s dream, Punta Gorda Isles is a waterfront community with 65 miles of wide, saltwater canals providing easy boating access to Charlotte Harbor. Homes in Punta Gorda Isles line the canals or the emerald green links of St. Andrews Golf Course. Almost every residence has waterfront access with a dock; real estate offerings include luxury estates, single family homes, condos, and lots for new construction. View Punta Gorda Isles homes for sale. Just south of Punta Gorda Isles is Burnt Store Isles, a beautiful waterfront community where boaters can dock right behind their home and enjoy access to Charlotte Harbor via Alligator Creek, a natural river. Burnt Store Isles was created with boaters, nature lovers, and golfers in mind. The Twin Isles golf course is a short walk or drive for all residents. Most of the homes in Burnt Store Isles have been standing since 2000 and lots are available for new homes. View Burnt Store Isles homes for sale. Pirate Harbor is one of Southwest Florida’s best-kept secrets. The neighborhoods of Pirate Harbor beautifully conform to canal formations that allow boaters to quickly access Charlotte Harbor for fishing and recreation. Homes in Pirate Harbor range from Florida ranch, Key West to modern contemporary-styled homes; several waterfront parcels are available for new homes. View Pirate Harbor homes for sale. A gated luxury yachting and resort community perfect for the nautical enthusiast, Burnt Store Marina offers a deepwater, direct access marina with 525 slips accommodating boats up to 100 feet. The marina is the largest on Florida’s west coast, and Sail Magazine ranked Burnt Store Marina one of the “TopTen Places to Sail.” Burnt Store Marina offers waterfront homes and condos plus a challenging 27-hole golf course. View Burnt Store Marina homes for sale. Charlotte Harbor, Florida is teeming with natural beauty and wildlife. The communities that surround this harbor are unique and offer homes at various prices, but one thing that these communities have in common is the love of being on the water. If you enjoy boating, fishing or sailing and plan on moving to Florida, you’ll want to consider the Port Charlotte and Punta Gorda area. 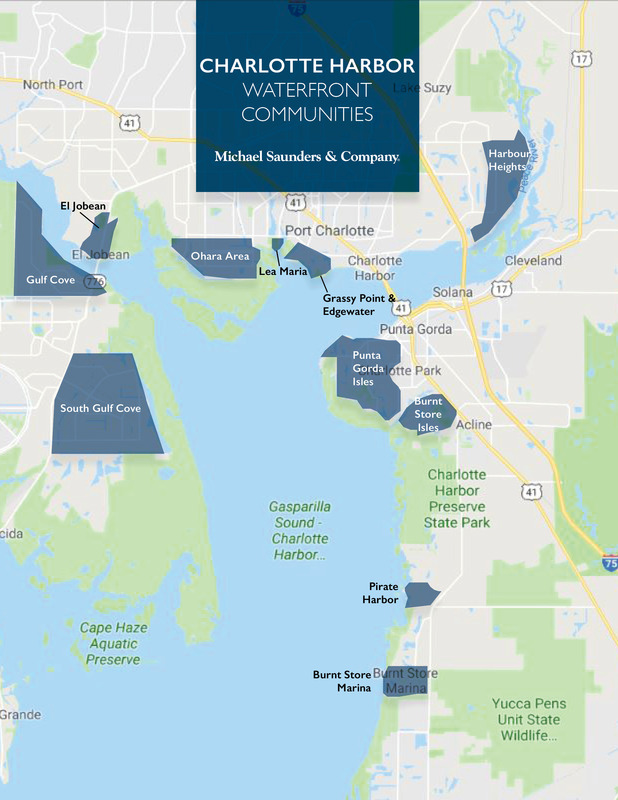 Michael Saunders & Company has several offices that serve this area including Downtown Punta Gorda, Punta Gorda – Burnt Store Marina and our Englewood, Florida office. We invite you to stop by and visit our offices or call us at 888-552-5228. Our team of real estate professionals will gladly discuss the various waterfront communities in Southwest Florida, review your needs and assist you in finding just the right home on or near Charlotte Harbor.